Before you pack your portable storage container, consider the details of your portable storage and moving needs, such as how long your container will be in our secure storage warehouse and/or on the road, on its way to your new home or office address. Upsizing from a starter home, relocating for a job transfer, or downsizing for an empty nest? In this case, you’ll pack most of your belongings for a few weeks/months of storage. If you don’t close on your new house (or begin your new rental lease) in your originally-planned time frame, we can arrange to economically extend your storage for as long as you need. When you’re ready, we’ll promptly deliver your container(s) to your new address. If you have a child going off to college, and you’d like to reclaim their room as your home office or guest bedroom, storage containers can provide a perfect solution. You can place almost anything not taken to school in temporary storage and safekeeping for your soon-to-be graduate. Once packed, call us and your Walnut Creek storage company will take care of it. Items you only need for one or two weeks or months, around a holiday, need not take up space at home year-round! Pack away seasonal sports gear, plus seasonal event or holiday decorations, décor, themed dishes, extra guest furniture and more. TIP: Be sure to schedule a delivery date well in advance of the holiday (or ski trip). This allows you time to decorate your holiday scene, and perhaps take a family (or work team) photo, for your holiday card or invitations to your event. Original documents not available electronically. Consider a safe deposit box or hidden in-floor safe. Irreplaceable or non-insured possessions. Ask about our insurance options. Key out-of-season clothing, in case of a sudden winter warm-up or summer cool down. For example: don’t pack away all your boots and coats in summer. Extremely fragile items. These can break as Walnut Creek storage container contents shift. Our experienced, professional packing team can help ensure items are safely packed. Still, we recommend against the most fragile contents. Perishable items: Things like unopened beverages could potentially leak all over your other belongings. Your wine cellar contents may seem non-perishable, can go bad in a non-temperature-controlled warehouse. Also, don’t pack and store anything that can melt. Ask about our temperature-controlled storage options if you need to store such items. 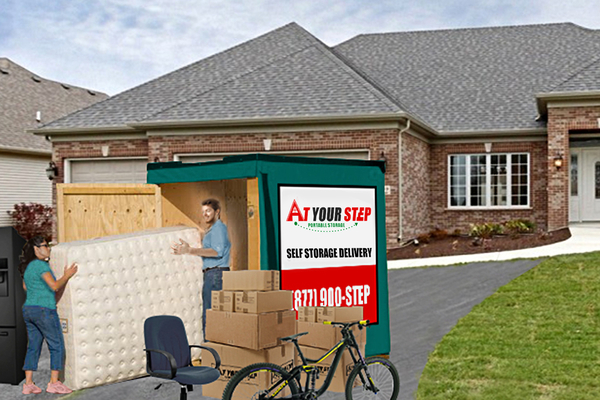 In today’s mobile world, At Your Step Storage makes your moving and storage chores simple, so you can concentrate on other things. We’re the go-to moving and storage solution for individuals and businesses relocating within (and from or to) the Bay Area and Northern CA. If you have questions about moving container storage, packing and delivery, contact At Your Step Storage online or call (877) 900-STEP today.